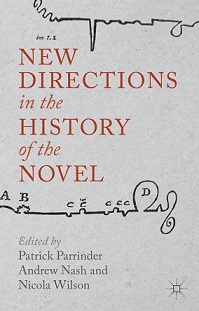 We were excited to see our edited book, New Directions in the History of the Novel, appear in print this month. This is a collection of 15 essays that examine various aspects of the history of the novel and includes methodological reflections on the writing of literary history. It is grouped into four sections – ‘The Material Text’, ‘Literary Histories: Questions of Realism and Form’, ‘The Novel in National and Transnational Cultures’ and ‘The Novel Now’. The book comes out of a conference we co-organised at the Institute for English Studies in London in 2009 and includes chapters from Thomas Keymer, Nancy Armstrong, Max Saunders and Simon Gikandi. We also have chapters in it – Andrew Nash writes on ‘Textuality Instablity and the Contemporary Novel: Reading Janice Galloway’s The Trick is to Keep Breathing On and Off the Page’ which draws on his teaching of Galloway in Modern Scottish Fiction and students’ increasing use of e-readers in class; Nicola Wilson’s chapter ‘Archive Fever: The Publishers’ Archive and the History of the Novel’ draws on her research in Special Collections to question what ‘business’ archives can bring to literary history and our understanding of the novel form; and Patrick Parrinder’s chapter ‘Memory, Interiority and Historicity: Some Factors in the Early Novel’ considers the early development of the novel and the genre’s dependence on the idea of a silent reader. The book is described by Professor Carolyn Steedman (Warwick) as ‘an important, accessible, and highly intelligent contribution to the history of the novel in a global perspective’. We hope people enjoy reading it! This entry was posted in Department of English Literature news and events and tagged Department of English, Department of English Literature, Dr Andrew Nash, Dr Nicola Wilson, New Directions in the History of the Novel, Professor Patrick Parrinder, Reading, University of Reading. Bookmark the permalink.